When Devon Yanko (formerly Devon Crosby-Helms) and Nathan Yanko decided to start their own bakery last year, they intended to keep up their running while baking bread. Nathan is an ultrarunner and was a baker at San Francisco’s famous Tartine bakery. Devon is a three-time member of Team USA in the 100K and has won the San Francisco, Oakland, and Napa Valley marathons. Oh, and she knows a little something about food, too. Turns out that running a bakery isn’t always consistent with running. The two opened M.H. Bread and Butter (the M.H. stands for Maximilian Hirtreiter) in May 2013 after raising over $30,000 on Kickstarter. They have been working around-the-clock to make the bakery one of the most popular post-run and pre-run stops for local athletes. M.H.B.B., as the regulars call it, sells fresh baked good and café lunches. And, it’s become a hub for long-distance runners. I always loved to run, but I was a basketball player in high school and part of college. I loved doing long runs as training for basketball, but never raced cross-country and track hadn't been my thing. I started running in 2003 when I was living overseas in Cape Town, South Africa. I had taken some time off of working out after I stopped playing basketball and was ready to start doing something again. My roommates and I decided to train for the Cape Town Half Marathon and the rest is history. I really loved it and got into running more and ran my first marathon in 2005. What are the race results or events you're most proud of? What are your plans for this upcoming year? I am definitely most proud of my results at the Olympic Trials Marathon, as well as Two Oceans Marathon (56km) and Comrades (89Km) – the most competitive races I've ever done! 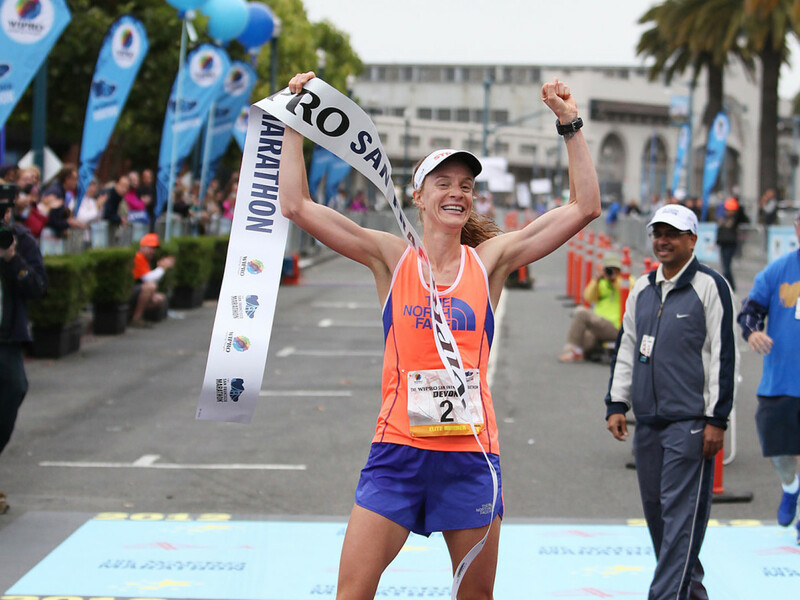 I am also really proud of winning the Bay Area major marathons – SF Marathon, and setting course records at Oakland Marathon and Napa Valley Marathon. My most proud trail accomplishment was setting the fastest known time on the Grand Canyon Rim to Rim to Rim with my good friend Krissy Moehl. How do you balance running with running the bakery? What's your average day like? How much mileage do you get in a week? Balance is really hard for sure. But I've learned how to squeeze my training in and am getting back on track towards real training. My average day is get up at 4-4:30 a.m., do some work at home, run, work at the shop until mid-afternoon, try and squeeze in a second run a few times a week or a nap, back to the shop to close up, dinner and early bed. Last year, though I don't feel like I was getting quality training in necessarily I never was at my peak, too tired, I still managed to run between 60-85 miles per week. What's your favorite local run? What's your favorite local event? Favorite run is definitely up around on the lakes on the Mt. Tam watershed. Favorite local event is SF Marathon. I recommend runs and hikes on Mt. Tam. It’s such an amazing back yard. The bakery has become a runner's hotspot of sorts. Why is that? It was definitely our intention. We know from our own experience that having a go-to spot for post-run fuel you can depend on is vital. There have been many a run where all we did was discuss where we would go eat after our runs. It was part of the reason we built our place, to be that hub. My two favorite go-to’s post-run (currently, the menu changes with the seasons!) are Shakshuka and the baked eggs. The crowd favorite is definitely the fried egg sandwich.